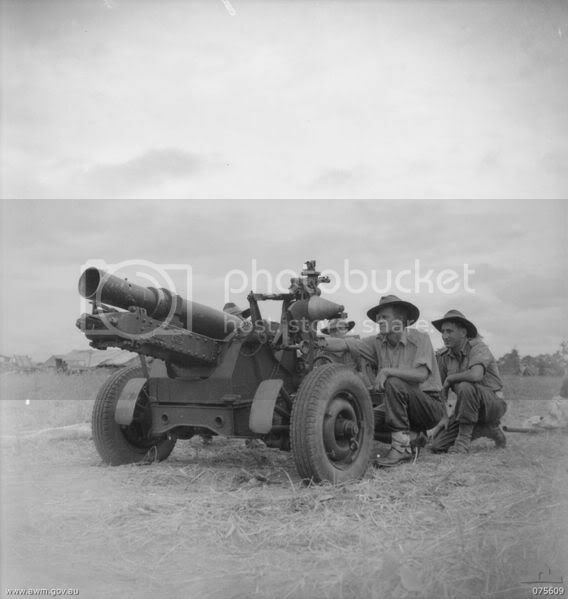 I might be alone here, but I kick the ball off by requesting a show of interest in a "Short" 25 lb gun as used by the Australians in the Pacific in WW2 in a 20mm scale. References - the Australian War Memorial for photos, and the book "Australian Military Equipment Profiles: Field Artillery 1939-1945", and if i can flaming find where i put it, a book on the "Guns of the Regiment" about the guns used in the RAA. What were the differences between the short and standard 25Pdr?? The short 25 lb didnt have the shield, and had a much shorter barrel and trails. 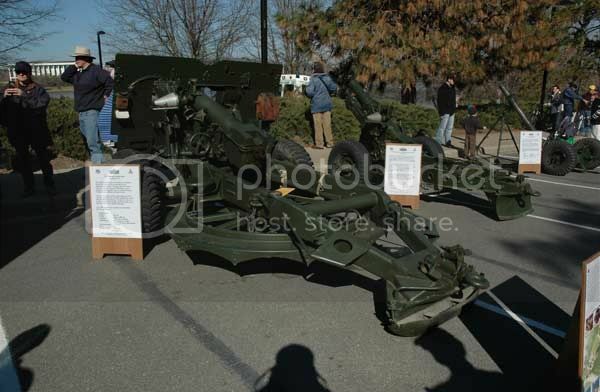 This had the effect of it kicking like a mule and causing concussion if served on for too long during a fire mission. But is did make it lighter and easier to deploy in a jungle situation. And was easily towed by a jeep. Yay! I found my book "Guns of the Regiment" which lists all the ordnance used by the Australian Artillery, so i can add that to the reference. looks like a photo taken at training to me..
or did they use the same carriage. the Pack 75mm had spoked wheels, different trails and spades (bit at the end of the 'legs' for you non gunners out there). The ordnance (barrel) is the big way to tell the difference here. If i can find a clear pic of both i will post them to show the difference. a carriage that folds in 2. Either way, the thickness of the wheels is a better way to judge the 75mm rather than the spoked wheels: the 75mm will have thinner wheels than those of the Short 25 in the pic next to its bigger brother. Sorry Simon, my Pacific Aussies are only intended for skirmishes. Even if I ever play them at a larger scale (say Mark Pipers Isururava scenario for RF!) any artillery would still be off table most likely. I wouldn't mind having them available (one can never know after all), but my interest is not high enough for me to join this build. Some Papuan Infantry Battalion chaps on the other hand! All my Pacific games are skirmish games, and my howitzers are intended for scenarios - game one is a beach head and I have to get the guns ashore intact. Other scenarios involve Japanese assaults on defended positions (so gun and crews need to be protected) to moving the guns off board before they are captured/destroyed. One good way to look at it is the 2nd episode of "Band of Brothers" where they attacked the gun position on D-Day, or the VC attack on Firebase Coral during the Vietnam war. Aussie gunners even parachuted into PNG during WW2 (first Aussies to do so) with a US parachute unit (503rd???). This is the one aka the Baby 25 isn't it? Put me down for 4 of. Ragnar wrote: This is the one aka the Baby 25 isn't it? I would recommend posting this (and others) up on the Guild forum and even The Society of Gentlemen Gamers. BattleScape wrote: I would recommend posting this (and others) up on the Guild forum and even The Society of Gentlemen Gamers. I am not a member of these forums... is there someone here that is that can make those posts? Hmm, you might have something there Dropbear. Scenarios revolving around guns as objectives might be something to look at. Do you know of any historical events where the Japs assaulted Baby 25's? Wasn't one broken up and hauled up the Kokoda track? I've got a picture of a 'normal' 25pdr being fired on the Huon peninsula with 9th AIF Division, btw. What was the ratio between regular and short 25 pdrs?